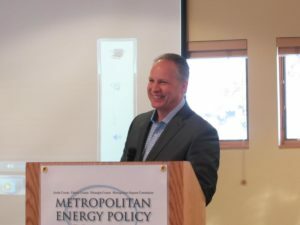 On February 6, 2014 The Metropolitan Energy Policy Coalition (MEPC) hosted an all day energy summit titled, Making Connections – Energy Trends and Our Vital Local Economy. 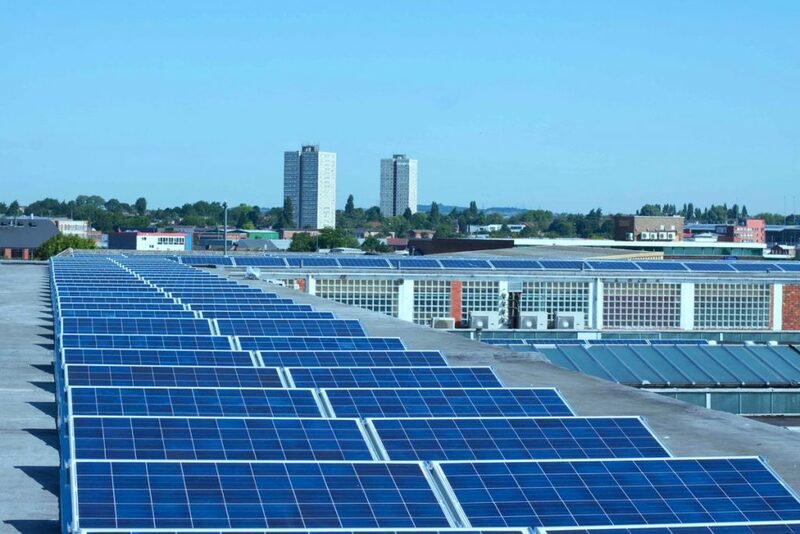 The summit brought together over 140 decision makers and other stakeholders from local government to uncover trends in the way we produce, distribute, and use energy. 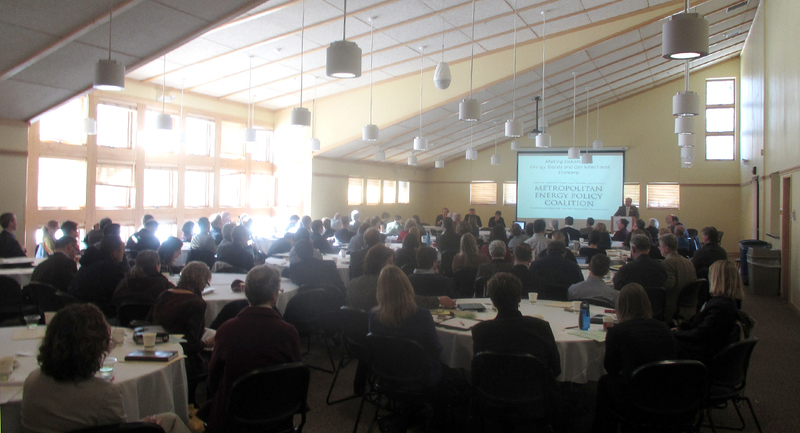 Attendees listened to high-caliber speakers and participated in discussions about the impacts of energy trends on the local economy, jobs, and economic development. The event took place at the Dakota Lodge, Thompson Park in West Saint Paul, and was coordinated by myself on behalf of Metro CERT and Great Plains Institute. The summit’s welcome was delivered by Metropolitan Councilmember Sandy Rummel, an MEPC member. Next, Rolf Nordstrom, President and CEO of Great Plains Institute, framed the day’s conversation by centering his talk on global trends affecting Minnesota’s energy and economy. Commissioner Tom Wolf, chair of the MEPC, introduced a short video from Senator Franken – and was frankly funnier than the Senator. In the video, Senator Franken shared serious issues he is working on at the federal level related to energy hearings and legislation being discusses nationally. Finally, Bill Grant, Deputy Director of the Minnesota Department of Commerce with the Division of Energy Resources, gave an update on the complicated state energy legislation that passed in 2013. 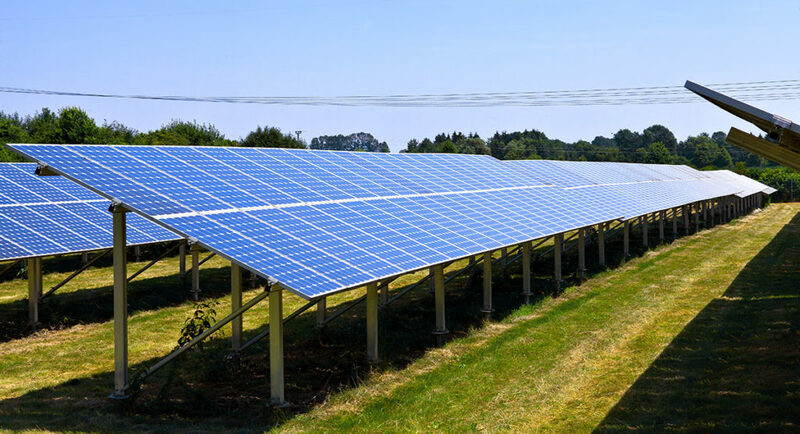 Legislation included a number of key studies shaping the future of Minnesota’s energy strategy, e.g., Minnesota Energy Future Study Scoping Report and the Value of Solar Heating and Cooling in Minnesota. A couple of interesting statistics from the presentation were the Minnesota Solar Standard is estimated to add 400MW of solar by 2020, and that the solar legislation directs the PUC to investigate the standby charges for net metering generators above 100kWh. To kick off the panel sessions, Bill then joined David Sparby from Xcel Energy, Betsy Engelking from Geronimo Energy, Kate Knuth with the Environmental Quality Board and Sheldon Strom from Center for Energy and Environment. They each responded to the question “What policy or policies are needed to further clean energy economic development?”One perspective out of the panel discussion related to the need to rethink the regulatory and incentive structures in place for utilities within the state, so that we “pay the utilities to do the things we want them to do” to advance clean energy in Minnesota. Additionally – we heard from the panel that we are starting at a good place, far ahead of other states AND energy efficiency has a 30% return on investment! The panel engaged in a lively discussion with county commissioners and local government officials in the audience. The second panel of the day focused on local policies related to clean energy and economic development and how local governments can support clean energy in the private sector and create jobs. The panel included Metropolitan Council member Jon Commers, Rosemount City Councilmember Jeff Weisensel, and CR Planning’s Brian Ross. 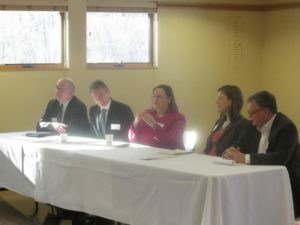 The panel was moderated by Craig Johnson of the League of Minnesota Cities. Each panelist presented for 10 minutes about their work related to the panel topic followed by a question and answer discussion with the audience. Our lunchtime Keynote speaker was introduced by Dakota County Commissioner Tom Egan and delivered by Lena Hansen from the Rocky Mountain Institute. She has been deeply involved in the Minnesota Energy Futures Scoping Report, working closely with the Minnesota Division of Energy Resources. Lena focused on macro-level energy trends and their impact on the state’s electricity system. She also shared with the audience highlights from the scoping study Rocky Mountain Institute prepared for the state. She provided great insight into the changing energy system and associated opportunities and challenges. Ms. Hansen also joked about preparing for the zombie apocalypse with microgrids. The first afternoon panel focused on practical implementation of energy solutions, and what strategies are being used now to benefit our local economies. The panelists included Jack Kluempke, the Made in Minnesota Business Advisor at the Division of Energy Resources; Steve Lawrence, the Facilities and Fleet Superintendent for the City of Brooklyn Park; and David Bergstrom, Chief Operating Officer of Wellington Management. The panel was moderated by Trevor Drake from Metro CERT and Great Plains Institute. Kluempke said that 150 Minnesota companies are in the solar energy supply chain! Lawrence shared that their use of performance energy contracting to improve old ice rinks resulted in cash positive in 4 years. We ended the day with a panel on trends, opportunities and takeaways focusing on what energy options are emerging to take us from where we are to where we’re going. Hennepin County Commissioner Peter McLaughlin introduced our panel moderator Michael Langley the founder and CEO of Greater MSP. We had a high powered panel of all women, including Kari Howe, Minnesota Department of Employment and Economic Development; Fran Crotty, Minnesota Pollution Control Agency; Jill Curran, Minnesota Chamber and MN Waste Wise Foundation; and Nina Axelson, District Energy/Evergreen Energy. By all accounts the energy summit was successful in bringing together local decision makers and stakeholders to engage conversation about energy trends and the impact on our local economy. This was a waste-free (and Yummy!) event thanks to caterer Common Roots and their partnership with Eureka Recycling! The Metropolitan Energy Policy Coalition (MEPC), comprised of commissioners from Anoka, Dakota, Hennepin, Ramsey, Scott, Sherburne and Washington counties, members of the Metropolitan Council and the Metropolitan Airports Commission, engages in matters of strategic interest to meet the needs of Minnesota Counties to secure safe, reliable, economical, and environmentally responsible energy sources. 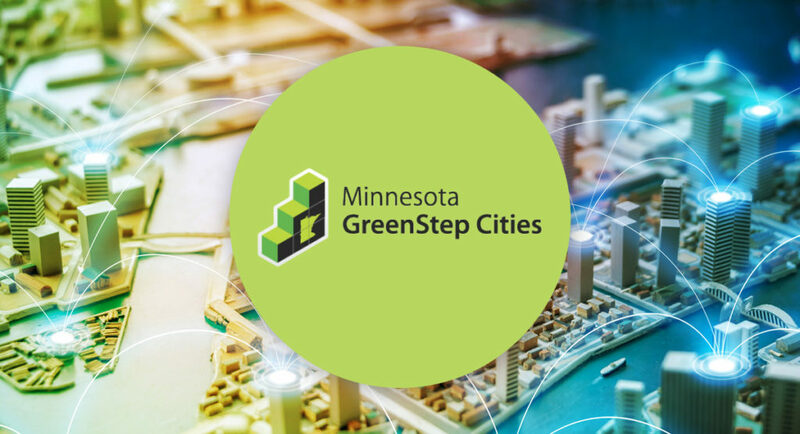 The MEPC works to develop renewable energy sources, improve the efficiency with which energy resources are utilized, and contribute to Minnesota becoming energy independent.